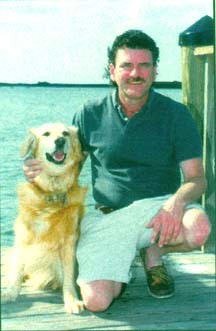 Jim Sparks with his dog, Tucker, when he lived in, Ft. Myers Beach, Florida, 1999. September 29, 2006 Las Vegas, Nevada – Eleven years ago at a conference about the human abduction syndrome, one of the participants was a man named Jim Sparks, born Jim Sparacino to his Italian parents fifty-two years ago on November 15, 1954. Jim explained that when he was thirty-four years old in 1988, he was happily married and had thriving real-estate work in both Texas and North Carolina. Then suddenly, beings from other worlds entered his life and he thought he was losing his mind. Jim Sparks had interactions with two different types: one category was the grey-skinned, large dark eyes, that apparently come in many varieties, including small androids that do work for taller, very intelligent controllers. From 1988 into the 1990s, Jim was schooled by the Greys in front of computers and 3-dimensional projections. 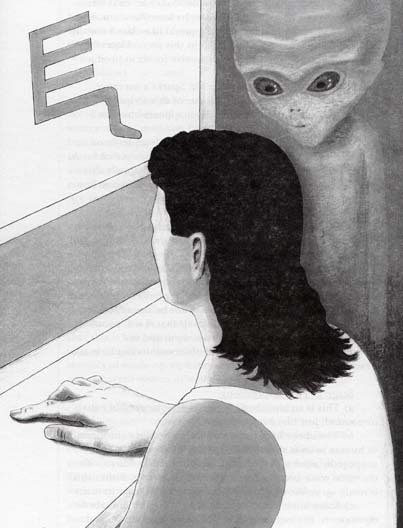 Jim was forced to learn the alien symbols and numbers. Eventually, Jim says he was also contacted by alleged U. S. government intelligence operatives who wanted to know about the alien symbols and numbers. Jim also had a conscious, face-to-face encounter with several tall, reptilian-skinned humanoids. Jim says those reptilians warned that the Earth’s environment is facing a crisis and that the planet must be saved, whether humans survive or not. 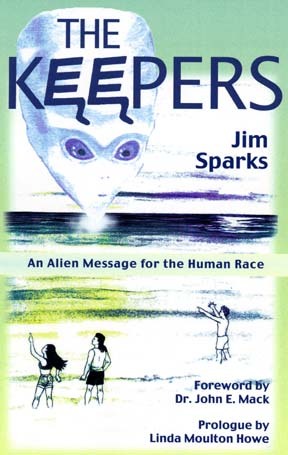 Now Jim Sparks has put his eighteen years of interactions with non-humans into a new book entitled THE KEEPERS: Alien Message for the Human Race. Of the many abductees I’ve interviewed, Jim has always impressed me with his down-to-Earth attitude and common sense. So, I recommend his new book, which can be ordered from the publisher on a limited promotional sale now at the toll free number given below. Jim has always stressed that when people see aerial craft jump from one side of the sky to the other, or see entities walk through solid walls, or feel a weight go down on their bed, but cannot see what’s making the weight – it’s all advanced technologies. Recently I asked him about his firsthand experiences with extraterrestrial abilities to manipulate time and matter. Drawing by Jose Galante © 1996 for Jim Sparks. Jim Sparks, Debt Consultant, Las Vegas, Nevada: “Time in their eyes is quite a bit different. If you are a time traveler, so to speak, it’s no big deal to you. It’s just another technological apparatus. You can go from Point A in time to Point B in time whenever you want, almost as simple as using a TV remote control. In fact, from what I can see and experience with these beings, it’s almost mundane and boring to them. It’s not even exciting to travel time. It‘s just something that they do. Since we’re stuck in it, time is extremely relevant to us. WHEN YOU SAY FROM YOUR PERSPECTIVE THE NON-HUMANS ARE EVEN BORED BY THE IDEA OF TIME TRAVEL, COULD YOU SHARE YOUR OWN PERSONAL EXPERIENCE ABOUT HOW YOU EVEN LEARNED THAT? I think by a mistake. There was one experience I just can’t get over. I know it will stick with me the rest of my life, regarding time travel. Before the mistake, I should share the fact that whenever I was ‘abducted’ – I still haven’t found the perfect word for that experience yet. I like to use the word ‘pulled’ because of the sensation. In the alien world, we would do certain tasks that would end and another task began. When the non-humans determined it was time to end, or for me to go back, a week could have gone by, a month could have gone by. Then no matter how long I had been gone, I would find myself exactly where I left off, as though I had never left, and as if the aliens had never pulled me. When I say a mistake, I had an experience – and bare in mind that 90% of them are conscious recall right in your face – where I was at home and got pulled in the late afternoon or early evening. I was watching television. I was on the sofa. My hand was on my head and my elbow was on the sofa. I was lying sideways watching TV. I had gotten up and walked over to get something to eat and drink to snack on from the refrigerator. So, I had to walk by an island in the kitchen and make a sharp right turn to get into the kitchen to get into the refrigerator. I got up from the sofa, walked across the living room. I have an aquarium, so I looked at my fish for a few seconds. Then I opened up the refrigerator door, grabbed a soda, drank it. Got something to eat. Shut the door and walked back around the aquarium in the living room and back to the sofa. And then I got pulled. I was not expecting it. I had a two-hour experience. This was the first time manipulation where it was firsthand in my face and it just astounded me. Because what happened was: I had gone through the abduction experience for the two-hour period. When I came back, I came back approximately a minute or two minutes before I originally left, meaning that I found myself back on the sofa. But like I was in two places at once, I could see myself get up from the sofa, walk around the aquarium like I did earlier and into the kitchen. I just sat there with my mouth shut in shock and didn’t make a sound. I could hear my footsteps. I could hear myself going into the kitchen. This other me watched from the sofa and heard the refrigerator door open, saw a light go on in the refrigerator, heard the sounds of me drinking the soda. I heard and saw the whole scene! Then I watched myself come back from the kitchen. This is not an out of body experience because let me set a foundation here. All this stuff is technology. I’ve stuck to the logic of technology. I am not letting myself drift to the left or right on that issue. When I saw myself walking back to the sofa, I just said, ‘Well, here comes me and what is ‘me’ going to do when it sees me now?’ But that ‘me’ did not even see me and as it got closer, it started fading and disappeared. So, I saw something in solid real life – myself – back a minute or two before I left! Another area that astounds me is an invisibility factor there. They have the ability to be invisible. Again, I just look at these things as technology, nothing more than that. I’m not going to get spooked by it. I’m just going to witness it and see if I can figure it out. I’m not a technician or a scientist. But I’m going to take as much of a science approach as I can. They just create some kind of electrical field and anything within that field, the laws of physics don’t apply as we understand them. That’s why sometimes you can see them as whole or other times you see them look faded. Or we see them walk through walls. Are they really walking through walls? Or are they displacing matter that is the wall in the field? They literally are going through solid matter. FROM A TECHNOLOGY POINT OF VIEW, IT SOUNDS AS IF THE NON-HUMANS CAN DEFLECT PHOTONS, WHICH WOULD MAKE THEM INSTANTLY INVISIBLE. AND THAT THEY ALSO HAVE SOME KIND OF CONTROL AND MANIPULATION AT THE ATOMIC OR MOLECULAR LEVEL? Their technology is so sophisticated – I’ll address one level. Again, it’s the invisibility thing again. They can toy with the mind. Remember, a perfect example would be if you are walking along the sidewalk and you see a red ant pile. Some how with technology, let’s say we manage to communicate with one of the ants. Our mind is thinking a million miles an hour and this ant is just looking up and saying, ‘Wow, for the first time I’m seeing a human face.’ How can you tell that ant what a car payment is? It does not even understand what anything is in our big world. So, relatively speaking, when I say toy with our minds, the E. T.s understand the basic human day-to-day stimuli and visuals. In other words, if you are in your car and driving down the highway – you’re looking at signs, you’re looking at the other cars, you might see a flock of birds fly by, all the natural things that we do. But what the E. T.s do is take the natural things and manipulate them, for example, into a flock of birds. You think it’s a flock of birds, because the non-humans will transmit an energy into your mind and work with the chemicals in your mind and the electrical system in our body and brain. So, you think you are seeing a flock of birds and so does everybody else on the highway. Actually, it could be a formation of alien ships. So, they are transmitting something that affects human minds. I UNDERSTAND THIS WHOLE IDEA OF A SCREEN MEMORY THAT HAS BEEN DISCUSSED IN THE ABDUCTION LITERATURE SINCE THE 1970S BY LEO SPRINKLE, BUDD HOPKINS, JOHN MACK AND OTHERS. THE SCREEN MEMORIES HAVE BEEN THINGS LIKE A DEER, OR AN OWL, OR BIRDS – NON-HUMAN MANIPULATION THAT CREATES DISGUISES. Absolutely. Something that you would just see every day and not give it a second thought! The reason I spot these things from time to time is that I’ve had so much exposure over the last eighteen years to E. T. technology and how they screen image and how they work. I’ve been adamant about not being friendly with them and just observing and having a frame of reference where I can understand and try to keep it as logical and scientific as possible – even though in the early years, it was pretty terrorizing. Their trickery – it’s so good! It’s like a chameleon. A chameleon can blend into the scenery. Or like an octopus that can do that at the bottom of the sea. They can look like the sea floor and the other fish don’t notice them. The E. T.s are such masters at this. They are absolute masters! One of their ships can be a car in your parking lot and you just don’t give it a second thought. Your brain just sees a car and goes on. It doesn’t even say the word ‘car’ in your mind. You’ve got to remember what we are dealing with. We are dealing with beings that have the capacity to retain and assimilate more data and process more data than we can. They’ve been around longer. They can think faster. IT SOUNDS LIKE THEY CAN TAKE ATOMS AND MOLECULES AND MANIPULATE THEM ANY WAY THEY WANT TO, TO LOOK LIKE ANYTHING THEY WANT US TO SEE. IT REMINDS ME OF A DEPUTY THEY EVEN SAW A GLOWING RED SQUARE IN A GROVE OF TREES WHERE THEY WERE INVESTIGATING ANIMAL MUTILATIONS AND THE NEXT MORNING. THERE WERE THEIR TIRE TRACKS WHERE THEY HAD STOPPED THE NIGHT BEFORE. THE GROVE OF TREES THAT HAD THE RED, GLOWING SQUARE IN IT DID NOT EVEN EXIST. EVEN THE TREES HAD BEEN SOME KIND OF SCREEN MEMORY. Exactly. But you’re dealing with different technologies. It’s almost like having a universal remote control. You’ve got the remote control that creates invisibility. You’ve got the remote control that controls the camouflage techniques. You’ve got the remote control button that can create a field. Another that can travel through time. Projecting Percentages of Matter – From Other Dimensions? It’s like an electrical field, for lack of a better definition. I’m not a scientist. But sometimes there is even a humming sound associated with it that I pick up. They create a field and they can manipulate not so much, from what I can tell – yeah, you’ll see things that they want you to see and they can manipulate matter in that way. What really intrigues me is the E. T.s can be 5% to 10% in this dimension on this physical plane while the rest is in another dimension. In other words, let’s say you are in your living room and you see something that looks like an apparition or ghost that you can kind of see through it. Well, they might be only 2 to 3% in our dimension and they are 98% or 97% solid in some other dimension. There are dimensions out there like layers of an onion, by the thousands, in a sense that they squeeze into. But they don’t really. The E. T.s molecularly change the vibration of something so they can be in another dimension and solid, but be projected here in only 5%. That’s when they are doing research work here and they don’t have to handle physical items or objects in our dimension or plane. I see sometimes they will be 40%, or 50% in our dimension if they need to move solid objects here. But, their self-defense is to disappear. So, if you charge at them, they are gone. Or if you charge at them by running at them in an attack or anything of that nature, you can put your hand right through them. With their science, I’ve seen them take an object, for example – something as simple as a can of soda pop. They can take one can of soda pop and make two cans of soda pop from it. Each can has 50% of the molecular structure and weight divided evenly. Then they can do it in quarters. Then they can do it in eighths. Then they can break it down into thousandths. Then the next thing you know, you are looking through those cans. That’s what the E. T.s do with their technology – push a button and you have time travel. Push another button, you have invisibility. It’s not like each individual E. T. is a high tech wizard. They are just like any other person who is using a tool. DO YOU HAVE ANY SENSE NOW IN 2006 WHERE THE REAL ORIGIN IS FOR THE GREYS? Well, when we say greys – you have working beings, which in my experience are created just for that purpose. They are part biological, they are part robotic. These things are used as a tool for labor, for tasks, even if it’s technical. I think a lot of the beings are mistaken tools, or biological working beings, are mistaken as extraterrestrials. My experience primarily has been in what you would call greys and some referred to as reptilian, snake-like, lizard-like beings. They all seem to have these little workers as a tool. When you ask, ‘Where are they from?’ Could it be from working in another dimension? Could it be from another time? From another place? Can it be from another star? Can it be a race of E. T.s that are not from the two I just mentioned? But the E. T.s will have the little worker beings with them, too? When you take in consideration that traveling time means nothing and invisibility is nothing. Getting from point A to point B is nothing. What I have learned about them is they are extreme masters of deception, meaning that almost anything we can come up with – and I’m not trying to belittle our scientists or agencies that are studying this stuff – the E. T.s can lead them to believe, as you could an ant, anything they are using. JIM, WHAT NOW IN 2006 DO YOU IN YOUR HEART THINK THE GREYS AND WHOEVER THEIR INTELLIGENT CONTROLLERS ARE, WHAT DO THEY WANT? The Keepers: An Alien Message for the Human Race © 2006 by Jim Sparks, published by Wild Flower Press. Jim’s new book can be ordered from the publisher on a limited promotional sale for $19.00 through October 1, 2006, at this toll free phone number: 800-366-0264. Beginning Monday, October 2, 2006, the normal price will be: $24.00 at 800-366-0264. For further information about the human abduction syndrome, please see reports below in the Earthfiles Archives. 02/22/2003 — Part 1 – Corguinho, Brazil: Farmer Describes His Transport to A Non-Human Craft on September 15, 2002. Previous PostPrevious E. coli O157:H7 – Why Can’t It Be Washed Off Contaminated Spinach?